November 2nd webinar identifies best practices in contact center supervisor training. Both Ovum and Qualfon have studied the effects of supervisors in the contact center environment. We’re very eager to share our key findings and open the discussion on this valuable topic. 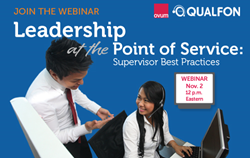 Qualfon, a people-driven business process outsourcing (BPO) company and global provider of contact center services, is hosting an educational webinar, Leadership at the Point of Service: Supervisor Best Practices on November 2, 2015 at 12:00 p.m. Eastern. The live, online event features Peter Ryan, Principal Analyst at Ovum, who will present the latest research on contact center challenges and the pain points supervisors face. As Ryan interviews Qualfon CEO, Mike Marrow, he will guide a discussion around best practices for transforming supervisors into leaders. During the event, Ovum and Qualfon will identify best practices on how to transform supervisors into contact center leaders that increase KPIs, decrease employee attrition and lower operational costs. Additionally, Mike Marrow will explain how Qualfon created a Leadership Academy in which all supervisors complete 19 leadership training courses and achieve Six Sigma green belt certification.